Bell Syndicate (Miss Fury, Don Winslow), he did Beautiful Babs, but that one had a similarly brief run. At King Features (Popeye, Flash Gordon), he finally launched one that clicked — Dumb Dora. Chic Young's Dumb Dora (actual name, Dora Bell) debuted from King Features in 1924, as a seven-day feature. Despite her subtitle, "She's Not So Dumb As She Looks", she sometimes did act as well as look very, very dumb. 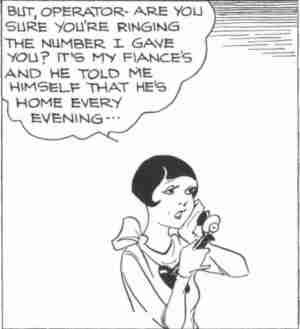 She was a typical young woman of the flapper era, with a reasonably steady boyfriend, Bing Brown, and a crowd of other suitors. There weren't any movies about her, nor were her strips collected into book form, but she did fairly well on the newspaper page. Well enough that in 1930, Young asked for a raise and ownership of the Dora property. King refused, but did offer an opportunity to create a new strip that he could own from the beginning. He responded with another one about a pretty girl — Blondie, who really clicked. As Young shifted his attention to the newer creation, the Dumb Dora strip was taken over by his former assistant, Paul Fung (who later handled the daily Polly & Her Pals). Fung added the Sunday page's topper, When Mother Was a Girl. In 1932, both were taken over by Bill Dwyer (whose other credits, such as Sandy Hill and Mr. Dilly, are even more minor). Of even greater interest is the diversity among assistants who worked on Dumb Dora over the years. They include Milton Caniff (Male Call, among others), Bob Dunn (They'll Do It Every Time), Boody Rogers (Sparky Watts), and even Whitney Ellsworth (later the top-ranking editor at DC Comics). Despite the high-power talent, King discontinued Dumb Dora in 1935. She had one last gasp the following year, a Big Little Book from a very minor publisher, but hasn't been seen since then. Her name still echoes through the public consciousness, but that's probably more because of Gracie Allen than Dora Bell. Text ©2006-10 Donald D. Markstein. Art © King Features.